★ Color: clear/transparent, blue, green, opal, white, brown etc. Anti-uv: compared with glass, the uv coating pc sheet will not turn yellow /hazy/degrade under the sun exposure. Bendability :It can be cold bending .The min bending radius is 175 times of thickness. It can be formed into arch and semicircular etc. 5. Impact Resistance: 30times of acrylic and 250-300times of glass in the same thicknessNo crack appears after 3kg hammer falls down the sheet within 2m height.Therefore , it is called “infrangible glass” and “sound steel”. 6. Sound insulation: 3-4Db higher than glass at the same thickness . It is the international preferred noise barrier material on highway. 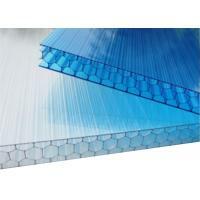 other plastic ,the heat insulation is 7% to 25% above the glass in the same thickness and can reach up to 49%. 8. Temperature endurance:doesn’t turn brittle at -100℃ and doesn’t turn soft at 135℃.good performance between -40℃ to 120℃. The yellow degree is 2 and light transmittance loss is just 6% after 4000hours accelarated aging test.